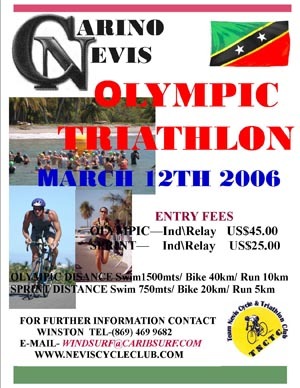 The 2006 annual Nevis Olympic Triathlon will be held on Sunday March 12, 2006. The event which is in its fourth year, is known for attracting competitors from far and near including England, Canada, USA, France, Martinique, Barbados, Jamaica, Trinidad, Sint Maarten, St Martin, Puerto Rico, Tortola, St Kitts and home team Nevis. The categories for this year's Nevis Olympic Triathlon include the Olympic category and the sprint category, which are both open to male and female individuals and relay teams. There is also an interesting category, the Try-a-Tri, which is an open category. The swim course for Nevis triathlon will take place at Gallows Bay in Charlestown and will entail a 1500 meter swim for the Olympic distance and a 750 meter swim for the sprint distance. At the end of the swim, competitors will run for about 60 meters along the bayfront to get to the transition area. For the bike course, Olympic competitors in the Nevis Olympic Triathlon will bike for 40 kilometers (two loops) along the island main road in Nevis heading towards the airport and the turnaround point, while the sprint competitors will bike for 20 kilometers (one loop). 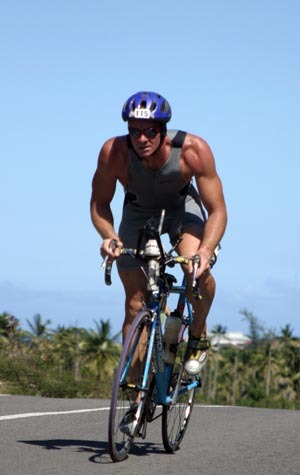 Unlike the bike course in the St Kitts International Triathlon, the bike course in the Nevis triathlon is relatively flat, with only one 'serious hill' just beyond the Oualie Beach Hotel. The last leg of the race is the run course, a 10 km run (two laps) for participants in the Olympic category and 5 km (one lap) for those in the sprint category. The run course of the Nevis Olympic triathlon will take participants from Charlestown north towards to the entrance of the famous Four Seasons Resort where they will then turnaround and head back to the capital Charlestown and down Hunkins drive to the finish line. Entry fees for the Nevis Olympic Triathlon are US$45.00 per person for participants (individual/relay) in the Olympic category and US$25.00 per person for participants (individual/relay) in the Sprint category. 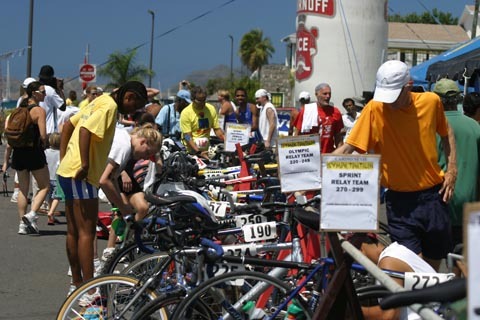 Registration forms are available online at the Nevis Cycle and Triathlon Club website. 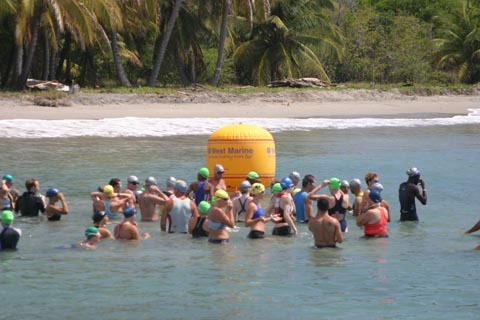 Oualie Beach Hotel and Sea Spawn Hotel are providing special accommodation rates for the Nevis Olympic Triathlon. 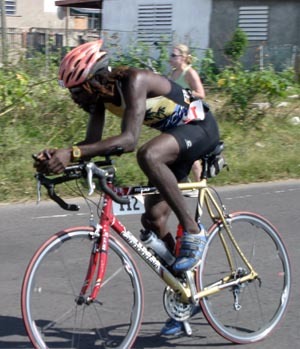 Photos compliments of the Nevis Cycle and Triathlon Club website.